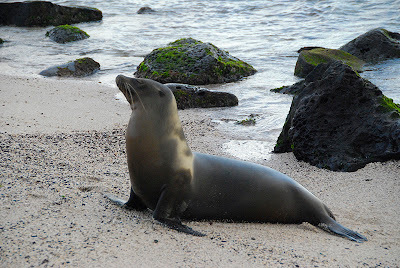 We have already seen and photographed all kinds of wildlife since arriving in the Galapagos, but I thought the Galapagos sea lions deserved a post of their own. They are so photogenic, we can’t stop taking pictures. I mean, look at this poser! 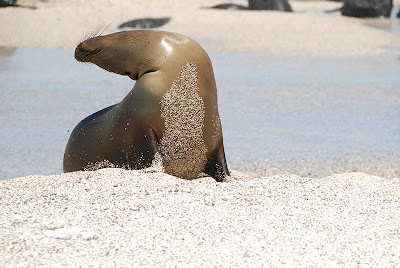 As you can tell by the above photo series, Galapagos sea lions really know how to take it easy. If they’re not copping rays after the ultimate sand bath, they are lazing about in turquoise pools or frolicking in the waves. Perhaps the struggle for survival is not as difficult here at the Equator as in the northern latitudes. Unlike the hungry-eyed beggars I’ve seen circling the fishing harbors in Kodiak or Coos Bay, every ounce of the sea lion’s energy and concentration does not seem to be focused on getting its next meal. Galapagos sea lions, it seems, enjoy their leisure time. 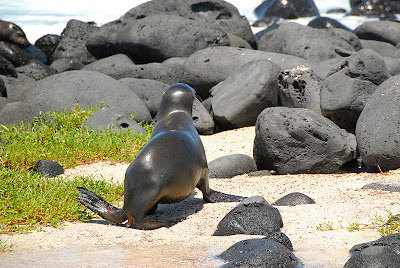 Galapagos sea lions are smaller than the Steller sea lions we are used to seeing up north. 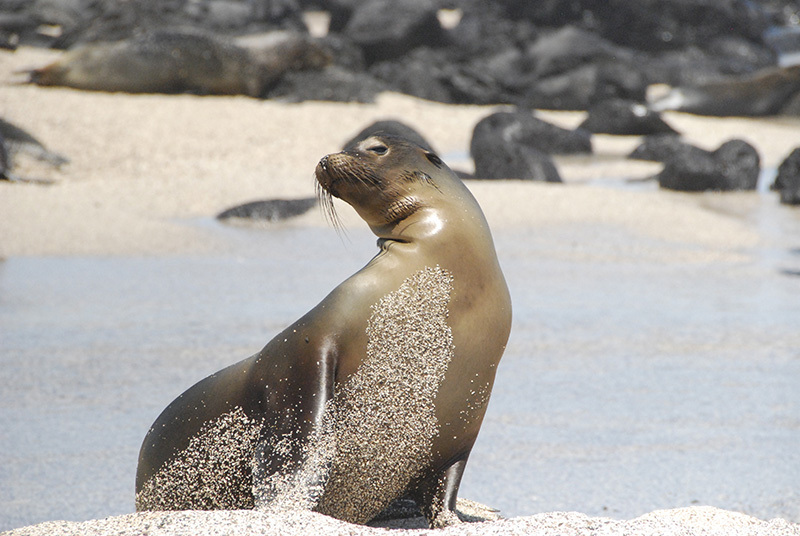 The Galapagos sea lion is more similar to a California sea lion, ranging in size from 100 to 800 pounds. By comparison, male Steller sea lions can weigh over a ton, and even females can weigh up to 1000 pounds. Another difference is that the Galapagos sea lions seldom swim more than ten miles out to sea; while Stellers are known to travel hundreds of miles offshore. Male Galapagos sea lions have the same pronounced forehead as male California sea lions, a result of their underlying bone structure. The coloration of the Galapagos sea lion is dark brown when wet and a lighter tan to chocolate brown when dry. 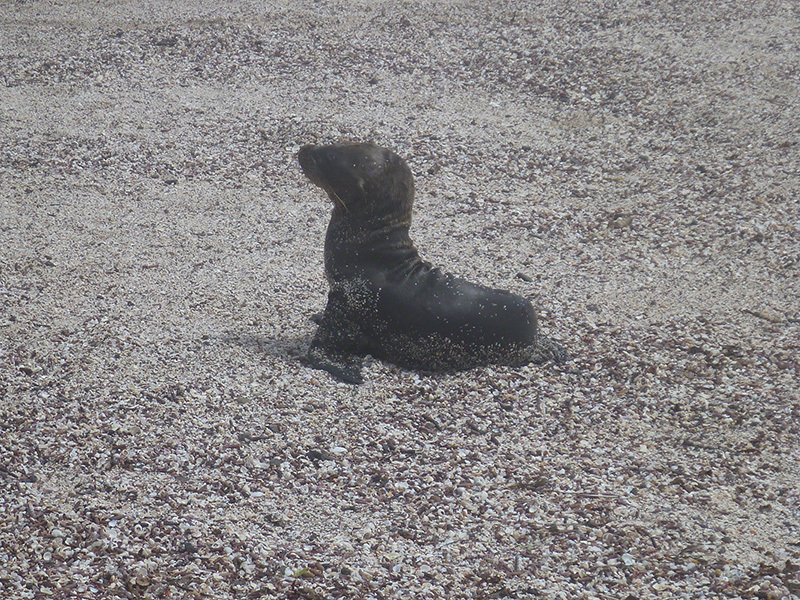 The pups are a rich coffee-color, and their fur (when very young) seems to have a different texture than the adults. This pup appeared to be engaging in "teething" behavior. The port of Puerto Baquerizo Moreno is very tolerant of its sea lion population. 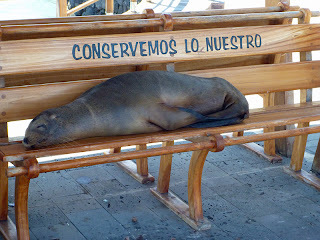 I remarked to Patrick that San Cristobal is more tolerant of their sea lions than the United States is of its homeless population. I’m thinking specifically of Seattle, which redesigned many of its bus stop benches to be half-size so that homeless people wouldn’t sleep on them. Not a problem for sea lions at Puerto Baquerizo Moreno! Sea lions occupy much of the waterfront real estate. One finds them everywhere: on park benches, in gazebos, in planter boxes, lying across the sidewalks, and occupying plazas. 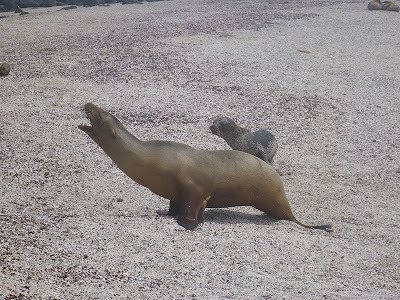 Although they are less skittish of humans than sea lions elsewhere would be, the sea lions do get a bit testy if you step too close to them; so you need to be constantly alert when walking along the waterfront. 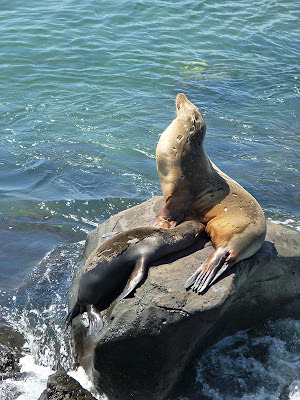 The sea lions have even taken over a manmade “kiddie pool” behind a breakwater along the shore. There are water slides with a sign that says “Solo Niños” (“Children Only”) and steps lead down to the water at one end of the pool. The steps are a favorite basking spot for the mums, and we have spotted the pups going down the slides! Patrick and I are in disagreement about the origin of the pool. I thought the wading pool was originally intended for human children, and that the sea lions usurped it for their own. Patrick thinks the pool was built specifically to showcase the sea lions and that the “children” on the sign means pups. 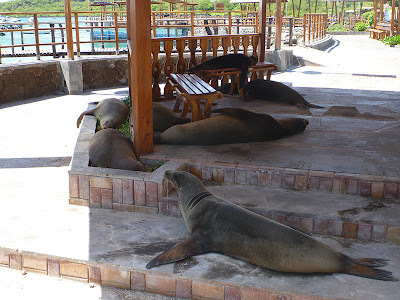 Another boat blog mentioned that the pool was designed so that children could swim together with sea lions, but I don’t know many mothers who would let their children swim in water that foul. 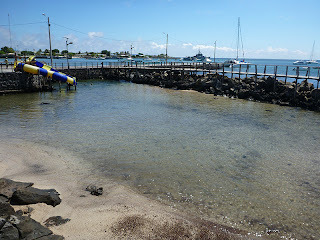 (Although the pool completely empties out at low tide and gets flushed daily, it is very shallow and very crowded with sea lions when full.) We did not get an opportunity to ask a city official about the design intent of the wading pool. 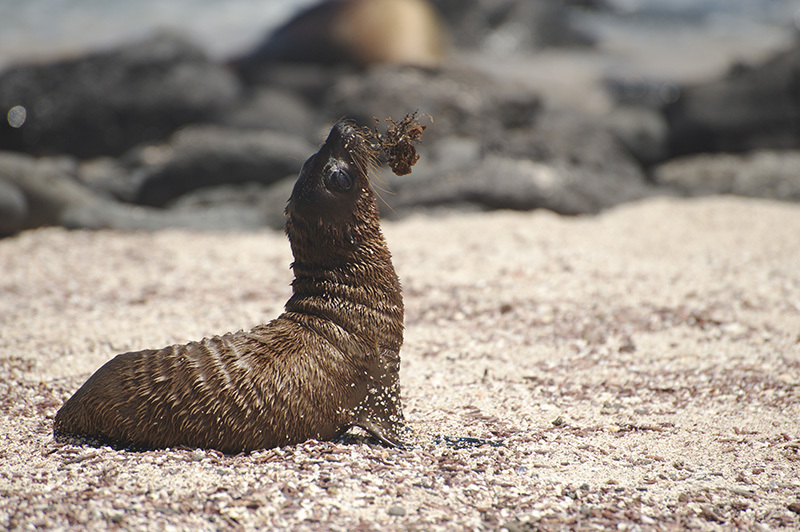 There is a plaza on the malecon (waterfront walk) with a bust of Charles Darwin that is occupied by a colony of female sea lions and their pups. (A colony consists of about 30 females.) I didn’t get a picture of it, but it was an excellent place to observe the females nursing and napping with their young. In general, evidence of maternal love was everywhere. This mother appeared to be training her cub to follow her bark. We saw very few males in evidence at San Cristobal. This was probably because we arrived just at the beginning of the lengthy breeding season, which lasts from May through January. Starting this month, one male will dominate a colony of females and pups, defending his territory fiercely. The colony of females he defends is called a "harem," but it differs from a real harem in that the female is free to move to a new bull's territory if she finds the dominant male unsuitable for breeding. The bull is so busy with his patriarchal duties during this time, he has no time to feed, and he eventually tires and retires to a colony of bachelor males. He is replaced in the female colony by a new dominant male. The bachelor males live in their own colonies apart from the females and pups. Possible bull: Note the thicker neck. 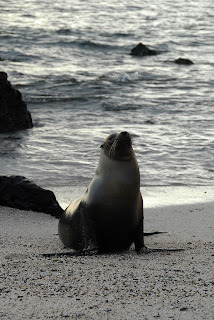 We visited a sea lion rookery called La Loberia. 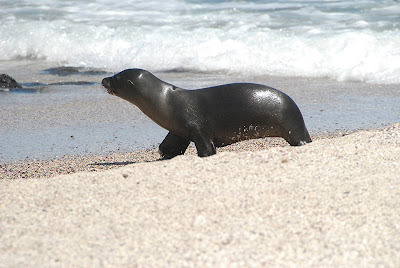 (“lobo marino” or “sea wolf” is the Spanish name for sea lion.) 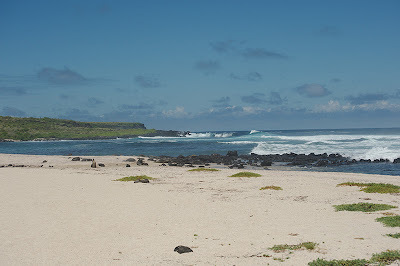 La Loberia is a beautiful white sand beach, upon which the surf, in its palette of turquoises and blue-greens, breaks against black lava boulders. 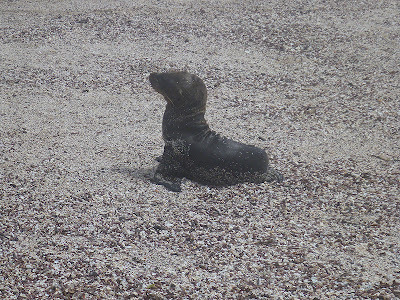 La Loberia is also one of the places marine iguanas are found. (Stay tuned for the next post!) We observed many sea lions relaxing here in a natural setting. 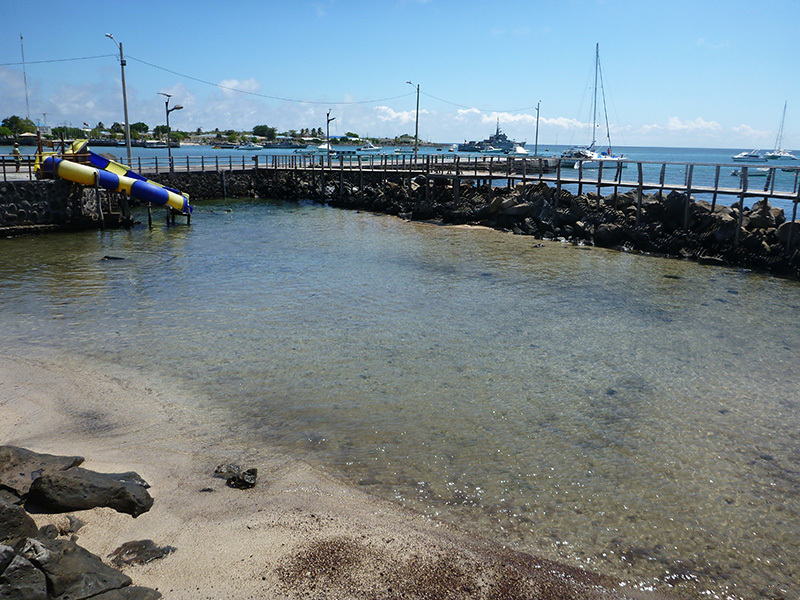 One of the highlights of our visit to San Cristobal was a snorkeling trip to Las Tijeretas. 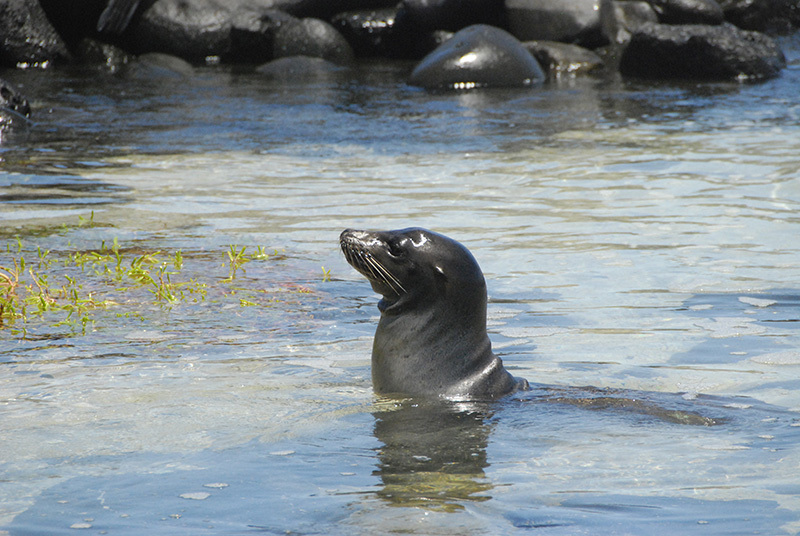 As we were snorkeling in the huge bay set under lava cliffs, some of the sea lion mothers and pups decided to join us in the water. It was a bit disconcerting to have these large animals rocketing all around you in the water, but it was also very exciting. They come almost right up to you at a very high speed before executing a flip turn and barreling off in another direction. 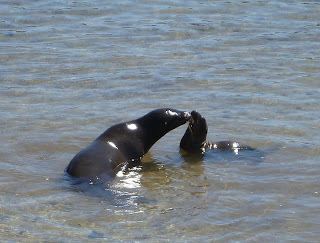 I followed the advice I had read about while visiting Isla Partida in Mexico (there was an opportunity there to snorkel with sea lions at Los Islotes, which we did not avail ourselves of) and kept my hands clasped behind my back, so the sea lions did not think my hand was a bit of food I was holding out to them. Although it was a somewhat unnerving, there was little real danger in swimming with the females and pups, because there was no alpha male defending the cove. We left the underwater camera on the boat during the snorkeling excursion (our transportation to the cove was a water taxi from which we exited directly into the water! ), so unfortunately we have no footage of our swim with the sea lions. 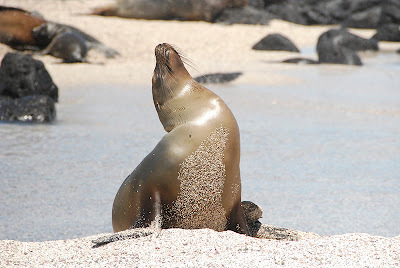 I wanted to end this post with a video clip of sea lions porpoising through the waves at La Loberia, but I am having trouble loading the video at the internet cafe I am uploading these pictures from (the connection on the boat is even slower.) I'll post it later if I get a faster connection. In the meantime, remember to make like a sea lion and take those sunbaths whenever possible! Enjoy the spring! I loved the post and the extensive pictures and story on these fabulous creatures - especially the way they are given free rein in town.